Tom Curran takes 5/35 as England successfully defend 259 to beat Australia and clinch the ODI series 4-1 in Perth. 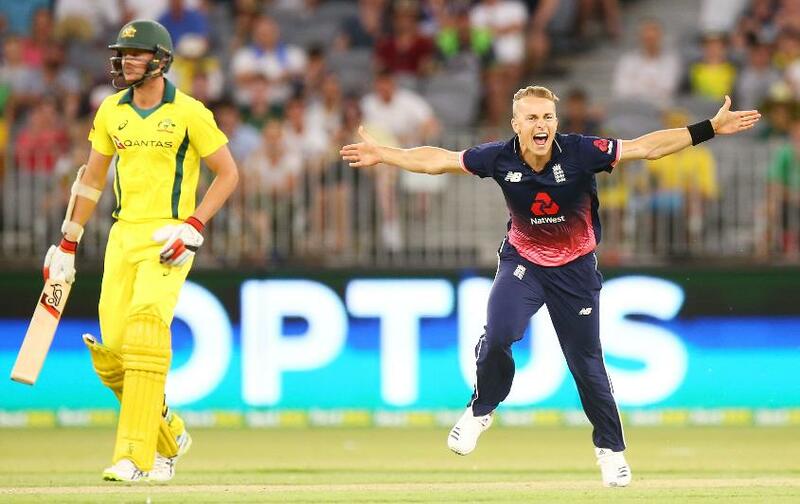 Tom Curran produced an outstanding spell of reverse-swing bowling to help England defend their score of 259 in Perth to complete a comprehensive 4-1 series victory over Australia. The 22-year-old seamer came on to bowl when the pressure was at its greatest, with Tim Paine threatening to see Australia home, and found a match-winning moment to complete his maiden five-wicket haul in ODI cricket. Paine had struck a four and a six off the previous over, bowled by a weary Jake Ball, to get the home crowd on their feet and dreaming of a dramatic run-chase. But Curran had other ideas, finding late swing to bowl the Australian wicket-keeper for a courageous 34 and complete a 12-run win. The impressive nature of England's victory is underlined by the fact it went against their normal run-heavy method of victory. Instead in Perth, England successfully defended a score below 260 in an ODI, without the assistance of rain, for the first time since February 2012. The result had been in doubt at many stages of Australia's innings. Marcus Stoinis' 87 from 99 balls and Glenn Maxwell's 34 from 39 seemed to the hosts on course, but they lost wickets at crucial moments and ultimately that was fatal. Stoinis hit an Adil Rashid full-toss to Curran at long-on to leave his side 189/5. When Maxwell fell lbw and Mitchell Starc was caught behind to Curran shortly after, Australia were reeling on 192/7. Paine, along with Andrew Tye (8) and Adam Zampa (11) clawed the hosts ever-closer, but Tye was caught out by a leading edge off the bowling of Moeen Ali (3/55) - who had earlier claimed a ludicrous caught-and-bowled to dismiss Mitchell Marsh - and Zampa was bowled by Curran looking to play an expansive drive. Paine got them close, but with last man Josh Hazelwood at the other end he was forced to up the ante and Curran's late swing did for him and Australia. Earlier in the day it had looked likely that England would post another big total. As has been their want of late, they got off to a flyer at the top of the innings, with openers Jason Roy (49 off 46 balls) and Jonny Bairstow (44 off 48 balls) taking full toll of the Powerplay, taking their side to 71/1 from 11.3 overs. Tye (5/46) dragged Australia back by having Roy caught just shy of his half-century. Alongside Alex Hales (35), Bairstow continued to tick along, hitting four boundaries and two sixes but Starc (1/63) bowled the Yorkshireman before Marsh (2/24) claimed the vital wicket of Hales to leave England 151/3 just past the half-way stage. And when Marsh picked up England captain Eoin Morgan soon after, Australia had wrestled back momentum. That England reached their 259 was then largely thanks to Joe Root, who found the gaps and rotated the strike intelligently to reach 62 from 68 balls while only finding the boundary twice. But Australia chipped away at the other end, dismissing Jos Buttler (21), Moeen Ali (6), Adil Rashid (12) and David Willey (2) cheaply as England's long batting line-up misfired. Tye was exceptional, claiming his maiden ODI five-wicket haul. It he who took the prize wicket of Root, caught by David Warner, to curtail England's innings. The right-arm seamer then cleaned up last man Jake Ball to clinch his fifth and England's 10th wicket with 14 balls left unused. England would have known their total was below par, but such is their confidence in the 50-over format they went at the challenge with gusto. Curran belied his years to lead the attack, while Moeen's guile did for out-of-sorts skipper Steve Smith and Morgan's sharp fielding ran out the dangerous Travis Head (22). 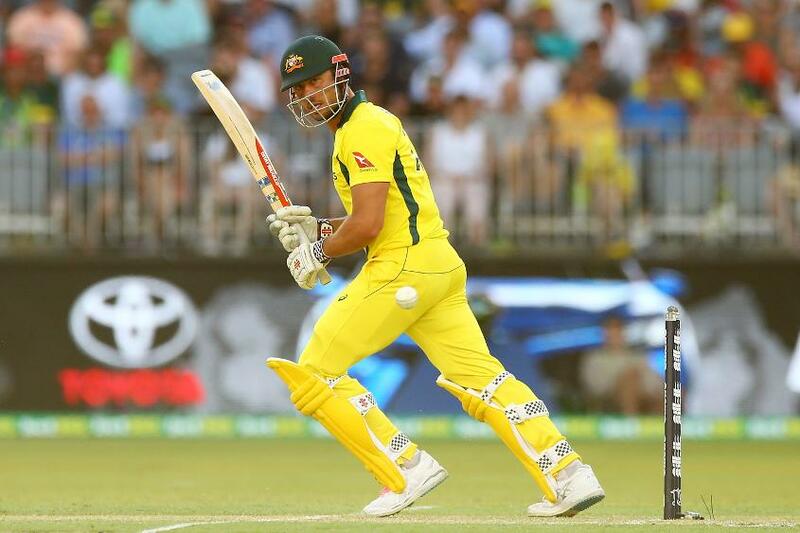 In a seesawing game, Stoinis crashed six fours and four sixes to put Australia on track, but once he and Maxwell were back in the dugout, it was down to Paine. Despite his brave efforts, it was Curran and England's day in Perth.